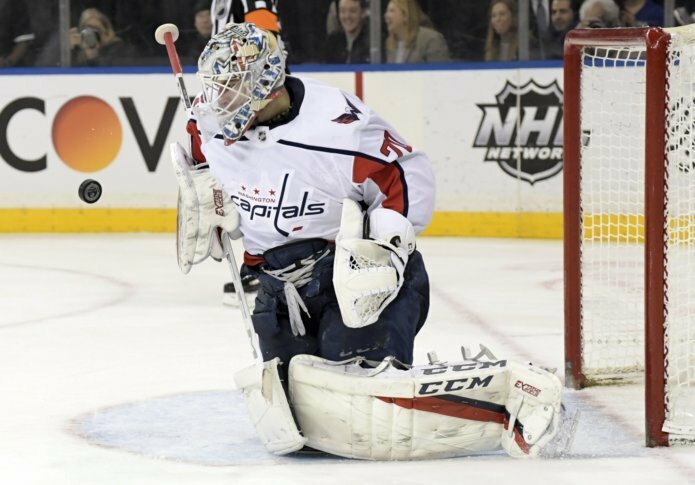 After last week's overtime thriller, the Washington Capitals again came out on top in the rematch in a bit stranger fashion, as a strange shootout goal by Ovechkin led to a 3-2 shootout victory for the Caps. After last week’s overtime thriller, the Washington Capitals again came out on top in the rematch in a bit stranger fashion, as a strange shootout goal by Ovechkin led to a 3-2 shootout victory for the Caps. Like last Sunday when the Capitals surrendered a goal to New York just 21 seconds in, they again gave up an early tally, with Ryan Strome making it 1-0 Rangers just 45 seconds in. But less than two minutes later, Carl Hagelin responded with his first goal as a Capital, fittingly against his former team. Soon after, Andre Burakovsky scored his ninth of the season to give Washington a 2-1 lead at the end of the first. The Capitals came out flying in the second, outshooting the Rangers 20-7. Still, they couldn’t get anything past Alexandar Georgiev, who finished with 37 saves on 39 shots. Pavel Buchnevich was able to even the score late in the second, tying it at two heading into the third. The final frame saw neither team convert on a number of opportunities as the game went into overtime. However, no one could break the time, and the game headed to a shootout. Alex Ovechkin scored the game winner in the shootout after Georgiev threw his stick on the attempt, leading to a Washington goal. The Capitals now lead the Metropolitan Division with 83 points for the time being, but the Islanders can tie them with a win over Philadelphia Sunday.